Mineola, NY – A recent study by College Factual found Mineola to be one of the best cities in the country for Men’s Basketball. The area was recognized in the rankings report for being a great city for student athletes. Scholars from all over the country come to the Mineola area to get their degrees. The city attracts a lot of international students, too. After graduation, many of these student athletes go on to careers that combine their love for sports with their academic major, such as coaching, sports journalism, and sports medicine. Every student should be armed with all the facts possible when they are making their college decision. 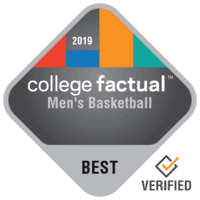 That’s one of the reasons why College Factual developed its Best Colleges for Men’s Basketball ranking. More than 3,000 universities were evaluated to determine these rankings. To learn more about how these rankings were derived, see College Factual’s Ranking Methodology. The following 2 colleges near Mineola have earned a distinguished spot within the top tier of this year’s ranking. Hofstra University is ranked #124 overall and #114 in the Division I Men’s Basketball category. Roughly 6,900 undergraduates call Hofstra home each year. The school has a student to faculty ratio of 14 to 1 and a freshman retention rate of 82%. In total, Hofstra supports 17 sports programs. Hofstra provides approximately $3,474,330 in sports-related aid to men and $4,643,479 in sports-related aid to women on an annual basis. Learn more about Hofstra University. St John’s University – New York is ranked #135 overall and #124 in the Division I Men’s Basketball category. Roughly 16,400 undergraduates call STJ home each year. The school has a student to faculty ratio of 17 to 1 and a freshman retention rate of 84%. In total, STJ supports 15 sports programs. STJ provides approximately $3,402,863 in sports-related aid to men and $4,666,428 in sports-related aid to women on an annual basis. Learn more about St John’s University – New York. The following is a list of other schools that offer Men’s Basketball programs near Mineola, NY. Adelphi University is ranked #14 in the Division II Men’s Basketball category. CUNY Queens College is ranked #68 in the Division II Men’s Basketball category. CUNY York College is ranked #384 in the Division III Men’s Basketball category. Farmingdale State College is ranked #141 in the Division III Men’s Basketball category. Long Island University – C W Post Campus is ranked #85 in the Division II Men’s Basketball category. Molloy College is ranked #15 in the Division II Men’s Basketball category. New York Institute of Technology is ranked #77 in the Division II Men’s Basketball category. SUNY Old Westbury is ranked #196 in the Division III Men’s Basketball category. SUNY Maritime College is ranked #180 in the Division III Men’s Basketball category. United States Merchant Marine Academy is ranked #147 in the Division III Men’s Basketball category.